Already a national leader in education reform, the University will consolidate its charter schools, teacher training programs and groundbreaking research with the creation of a new institute that will bring new resources to bear on the challenges facing urban public schools. The University has announced it will establish the Urban Education Institute to integrate and expand its many innovative programs that improve urban education at the pre-kindergarten through 12th-grade levels. As part of its fund-raising effort to support the institute, the University has raised $63 million from foundations, corporations and individuals in Chicago and across the country. Timothy Knowles, who has headed the University’s Center for Urban School Improvement since 2003, will be named the Lewis-Sebring Director of the Urban Education Institute. Due to launch Tuesday, July 1, the new institute will include the Consortium on Chicago School Research, the Urban Teacher Education Program, core functions of the Center for Urban School Improvement, and the University of Chicago Charter School, which operates four public elementary, middle and high schools on Chicago’s South Side. Knowles, who served as Deputy Superintendent of the Boston Public Schools before coming to Chicago, noted that the institute is creating a new model for urban school improvement by integrating academic research, teacher preparation and the development of exemplary schools. In addition to the direct operation of schools, research programs and teacher preparation, the institute’s work will be closely intertwined with the University’s Committee on Education, the academic unit within the Social Sciences Division and dedicated to the pursuit of multidisciplinary scholarship in education. Founded in 2006, the committee includes distinguished faculty members from economics, human development, mathematics, public policy, psychology, sociology and social service administration. University Trustee Charles Lewis (above) describes the University’s education initiatives to a group of Chase Bank Foundation representatives, who visited the Donoghue campus of the University Charter School early in May. Donoghue is one of four University-operated charter schools, and the schools are one component of the new Urban Education Institute. Lewis, who is chairman of the Lewis-Sebring Family Foundation, also is a member of the Urban Education Initiative Policy Board at the University. His wife, Penny Bender Sebring, is president of her family’s foundation and is the founding co-director of the Consortium on Chicago School Research, another component of the Urban Education Institute. The Lewis-Sebring Family Foundation has supported education initiatives at the University by funding the Lewis-Sebring Professorship, held by Stephen Raudenbush, and the newly launched institute’s directorship, held by Timothy Knowles. Chase Bank, which has an interest in community development in the mid-south region of Chicago, has previously invested in the Donoghue school through a $1 million gift to the Center for Urban School Improvement, which operates the University Charter School. The University has a long, distinguished history of outreach and enrichment programs for Chicago teachers, students and families, offered through a wide range of University units. The institute also will partner with the School of Social Service Administration, Chapin Hall Center for Children, the Center for Elementary Mathematics and Science Education, and other programs and individuals across the University involved in pre- K-12 education and youth welfare. The early predecessor of the institute, the Center for School Improvement, was founded 20 years ago. The Consortium on Chicago School Research was launched two years later in 1990. The consortium is the most extensive research enterprise of its kind, working in close partnership with the Chicago Public Schools to influence practice that directly improves the educational experience for Chicago schoolchildren. The consortium’s rich archive of quantitative and qualitative data on CPS is the largest of any urban public school system. It has published nearly 100 studies and reports on key reform issues, including the identification of “five essential supports” that lead to sustained improvement at elementary schools; why freshmen grades and attendance are a key predictor of high school graduation rates; and how urban schools can help students successfully transition from high school to college. “In addition to conducting meaningful research, we pay a lot of attention to how we share the findings so that urban educators and schools make use of them to improve their practices and policies, not only in Chicago but across the nation,” said John Q. Easton, Executive Director of the Consortium on Chicago School Research. Start-up programs in New York City, Baltimore and St. Louis are emulating the consortium’s approach. The University launched its first charter school in 1998 in North Kenwood/Oakland. Today, the University Charter School serves 1,100 students from pre-kindergarten through high school at four campuses. They include two elementary schools for pre-kindergarten through fifth-grade students, North Kenwood/Oakland and Donoghue; a separate North Kenwood/Oakland Middle School Campus for sixth- through eighth graders; and Woodlawn, a middle and high school that, by 2009, will serve students in grades six through 12. The University’s newest school, Carter G. Woodson, will open in the fall of 2008, serving sixth- through-eighth graders from University elementary schools and local children residing in the neighborhood. NKO Middle School will close its campus, as its staff and students move to Woodson. At full capacity, the University Charter School will serve 1,834 children. 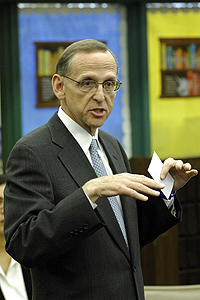 “Although the North Kenwood/Oakland school has the longest track record of performance, our four campuses already have demonstrated that all children can dramatically accelerate their learning if they are taught with skill and understanding and are provided with comprehensive academic and social supports,” said Knowles. At the University’s charter schools, where students are selected by lottery without academic screening, students consistently outperform those at comparable schools in Chicago, and a majority of students meet or exceed state standards. Donoghue Elementary was one of 11 schools nationwide and the only school in Illinois recognized for its outstanding student achievement gains in a study on behalf of New Leaders for New Schools. In addition, the University’s Urban School Improvement Network was launched in 2005 and currently encompasses 14 schools on the South and West sides, including the four University charter schools. The network’s goal is to add six more schools by 2010. 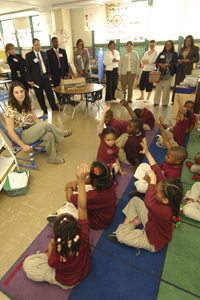 The institute’s charter schools and network of affiliated Chicago schools will serve more than 6,000 Chicago children by 2010. The institute also will expand its Urban Teacher Education Program, which leads to a Master of Arts degree in teaching from the Graham School of General Studies, plus an Illinois Teaching Certificate for elementary grades. Currently, about 25 teachers per year graduate from the program, and that number would double in the next few years with the addition of a high school preparation program in mathematics and science. More than 80 percent of UTEP graduates go on to teach in Chicago schools, Knowles said. Another innovative program that will continue under the institute is the Digital Youth Network, which teaches students in grades six through 12 to apply technology in creative ways to support ambitious teaching and learning. The network also provides a social space for students, called Remix World, which offers online mentoring and opportunities to share work and ideas beyond the school day. Other programs being developed are 6 to16, a college readiness curriculum and social network that will begin in 2009 as a pilot program in the Chicago Public Schools. The program’s goal is to increase the number of urban students who are accepted to and graduate from colleges. Students will be enrolled in the 6 to 16 network by grade six and will be supported through grade 16. The new Urban Education Institute will be housed in Chapin Hall, 1313 E. 60th St., where its component programs already are located. For more information about the institute, visit http://uei.uchicago.edu.